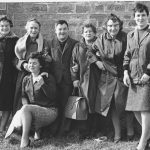 The majority of these photographs have been gathered from the ‘Times Past’ section of the Seaboard Community Newsletter. With thanks to our Seaboard Community Newsletter editor Patricia Woods for supplying the images. 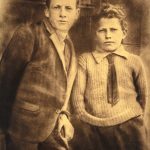 If you would like us to include some of your old family photographs please contact us. Back Row Left to right as viewer looks. 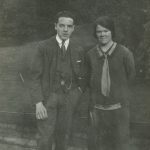 Margaret Sutherland [born 1899 educated Hilton School], Hugh Alexander Sutherland. Front Row Alexander Hugh Sutherland [Born Reay, Caithness], Alexander Hugh Sutherland, Helen Sutherland, Hughina Skinner, [Born Hilton 1873 married name Sutherland], Isobel Sutherland. 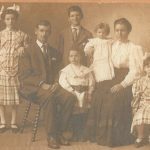 The family emigrated to the U.S.A. in 1907. 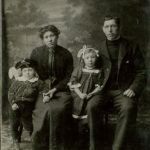 Christina and William Ross, with children David Alick and Retta. William and Christina Ross with their children, standing left to right as viewer looks. David Alick, Retta. Sitting Katie, baby Donald [Danna], William. Circa 1920. 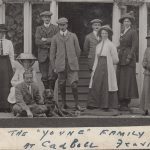 The Young Family, Cadboll. 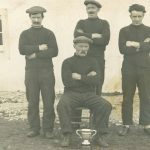 Courtesy of Tain Museum. 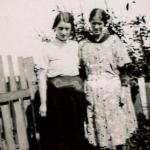 Bella Browning [Mrs A Mackenzie] with her granny Ann Vass [ Mrs Skinner] Bank Street, Balintore. 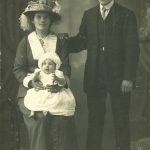 Jean [nee Wood] and Dan MacDonald with baby Janet. 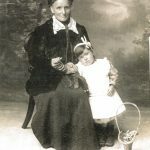 Maggie and Jane Wilson circa 1890. Back Row, left to right as viewer looks. 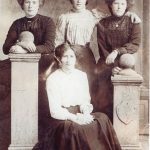 Kate Skinner, Tina Ross, Chrissie MacPherson, born 1891. Front Row. Dolly Noble. All cousins. 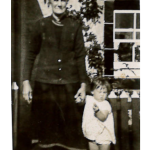 Jane [nee Wilson] and William MacDonald with little Jean outside 18 Shore Street, Hilton. Three Sisters, Left to right a viewer looks. 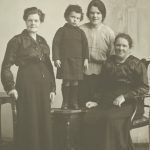 Christina Vass [Teenie Ross] born 1887, Isabella Vass [Gorman], Maggie Vass [Mitchell] born 1889. 3 Park Street Balintore. Courtesy of Shane Abdelnour. Johann Ross with children, left to right as viewer looks. 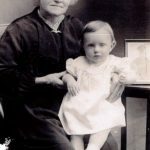 Annabel, Andrew [ MIA, Singapore, WW2.] and Catherine. 1914. Left to right as viewer looks. 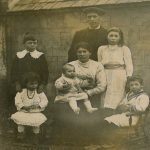 Willie Skinner [Bouyack], Margaret Catherine Skinner, Georgie Skinner, Annie Helen Skinner, Annie Skinner, John Skinner, Katie Skinner. Standing at back right. Bella MacKenzie [Dan], Katie Bell Skinner, ? MacKenzie [Dan]. Taken at the back of Hugh Street. Left to right as viewer looks. 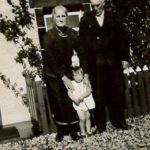 Jimmy Allan [1913-1930], Mother Barbara Allan [nee Ross], baby Babsie Allan [married name Skinner], Willie Allan [1915- 1984]. Picture circa 1917. 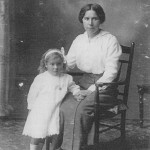 Anne Ross with daughter Jessie McRae [Shandwick], Anne is the 1st World War widow of Kenneth McRae. 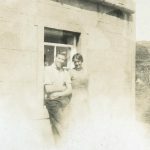 Agnes McRae [standing at back] Commercial Hotel. Jessie McRae [on chair] Shandwick. Aunt and niece. 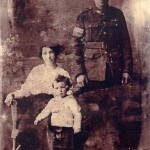 Isabella Ross and son Robert, Isabella is the 1st World War widow of Robert Ross. 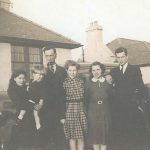 Jessie and Tom Vass with Babs, 4 Bank Street, Balintore. 1918. 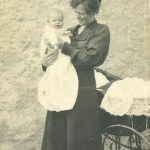 Christine McRae [MacPherson] with baby Murdo, Christening day 11th October 1920. Left to right as viewer looks. 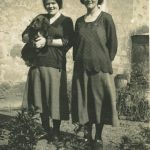 Christine [Cia] McRae and Agnes McRae, Commercial Hotel. 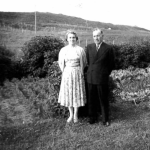 Photo taken at 4 John St.
Robert McRae, Christina [Cia] McRae, Commercial Hotel. 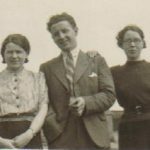 Left to right as viewer looks Mary MacColl [Spean Bridge] Great Aunt to Murdo McRae, Aunt Christine [Cia] McRae, Grandmother Christine McRae [Commercial Hotel]. Circa 1922. 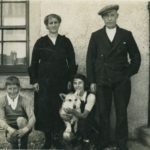 Jimmy Ross [Swiss], Jeannack [Jane Ross] Dan Ross [Swiss] 3 Shore Street, Shandwick, pre 1926. Left to right as viewer looks. Kenny Ross, Elspeth [Eipach], Annie Ross with dog Roy, Kenny Ross. 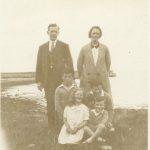 Catherine Ross [married name Mitchell], Shore St. Balintore. 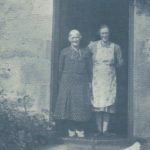 Daughter of Andrew [Reada] Ross, she and her sister Annabel [married name Anderson] married ministers, brother Andrew KIA WW2. 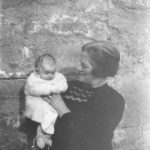 Baby Cia MacRae, John Street, circa 1925. Cousins. Left to right as viewer looks. 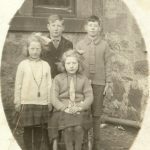 Margaret Allan, Willie Allan, Babsie Allan [married name Skinner, born 1917] ,Robert Ross [cousin]. Circa 1927. 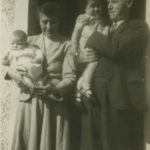 Andrew MacKay, Hughina MacKay with baby Susan Mackay. 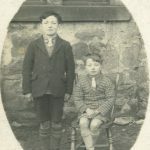 The sons of Sutherland Munro [Rockfield]. 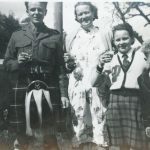 Sutherland [Syddie] Munro, Born 1916, Died 1981, Roderick Munro, Born 1919, Died 1985. 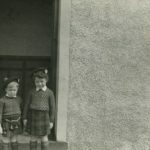 Photo taken outside Hilton School Circa 1927. 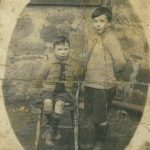 Murdo McRae and John [ Jackie ] McRae. Hilton School circa 1927. Back, left to right as viewer looks. 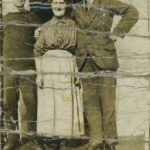 Willie Skinner [born circa 1876], Geordie Skinner [ born circa 1882], Davie Skinner [Auntie Helen]. Front. Davie Skinner [4 Shore Street born circa 1872]. 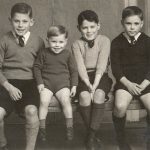 Willie, Geordie and Davie were brothers and the younger Davie the son of Geordie. Left to right, as viewer looks. Alistair MacKay, Lewis MacKay. [Roggle]. Back. 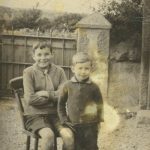 Archie McRae, Christine MacRae [nee MacPherson]. Middle. Jackie MacRae, Murdo McRae. Front. Christine [Cia] MacRae, Ken MacRae. 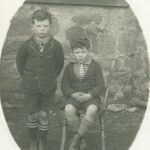 Hughie Skinner and John Skinner [Jacka], Hilton, circa 1925. Brothers. 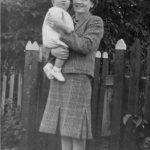 Elsie and Kenneth Ross, twins born 30/6/1924. 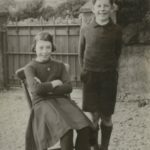 Andrew Ross [ MIA, Singapore, WW2 ] and his sister Catherine Ross, 1935. 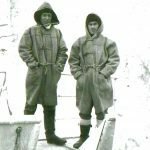 George and Alexander Patience, brothers, Hilton, on board RRS Discovery in the Antarctic. Courtesy of Tain Museum. Left to right as viewer looks. Lily May Taylor, Victor Williams, Ebenezer Taylor, Mary Ann ?, Christina Taylor [nee MacKenzie], William John Taylor. Ross Crescent, Balintore. Left to right, as viewer looks. 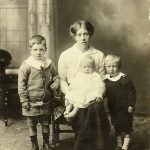 Alice MacAngus, Alexander MacAngus, Ina MacAngus. 2 King Street, Hilton. Brother and sisters. 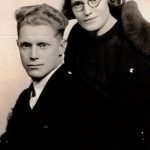 Robert Ross and his mother Isabella, Robert was lost at sea in WW2. 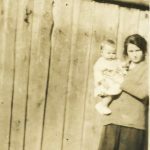 Alithia with Granny Johann Ross, 1941. 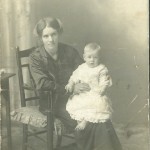 Alice Brunton [nee MacAngus] with son Tom. Hilton. 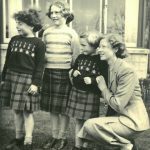 Christine [Teenie] Skinner [Ross] and Catherine MacRae [MacPherson], great aunt and great niece. 1941. 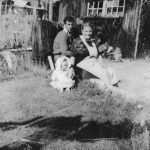 The Vass [Decca] Children. Left to Right as viewer looks. John, David [Dusty], Tommy, Robbie. Left to Right as viewer looks. 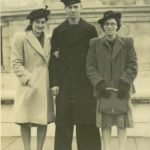 Frank Ross, Nellie Ross, Doreen Ross, John Ross. 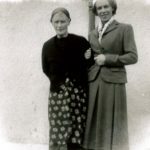 Christine MacRae [nee MacPherson] with grandaughter Mairi McRae. 1948. 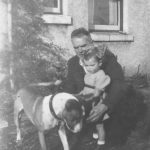 Murdo McRae with grand niece Mairi McRae and Simon the dog outside the Commercial Hotel, circa 1950. Attending the award of his DSM at Buckingham Palace. Left to right as viewer looks. 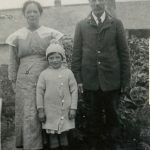 Isabella Vass [wife], Kenneth Vass [Keka], Barbara Vass [sister][married name Cushnie]. Left to right as viewer looks. 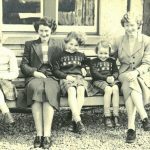 Janie Vass, Margaret Vass, Myra Vass, Ethel Vass. Left to right as viewer looks. 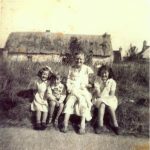 Margaret Vass, Isabella Vass, Janie Vass, Myra Vass, Ethel Vass. 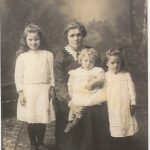 Elsie and Alexander Ross with James Alick and Jean. 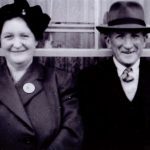 James Alick Ross and Jean Ross, brother and sister. Left to Right as viewer looks. 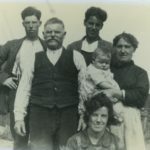 Ann MacDonald, Andrew MacDonald, Auntie May ?, baby Ian MacDonald, Margaret MacDonald. 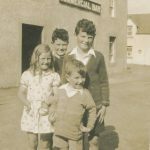 Taken at Mid Street, Shandwick, circa 1955. 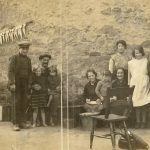 Mr. and Mrs. Kennedy Vass, 11 New Street, Shandwick. 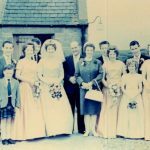 The Skinner Family [Buihhe, Gaelic for yellow, pronounced Buidhac ] 1964.Left to Right as viewer looks. David, Graham, Andrew, Anne, John, Catherine, Willie, Dolly, Alexander [Mack], Christina, Diana, Billy, Jean. 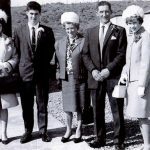 The Mackenzie Family 1965.Left to right, as viewer looks. Joan, Hugh, Katie Bell, John [Curly], Annella. Skinner Family [Bunts]. Left to right as viewer looks. 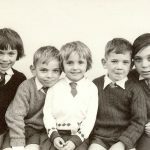 Moira, William, Shona, George, David. Back row, left to right as viewer looks. 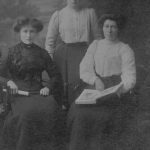 Isobel MacKenzie [Di], Ann MacKenzie [Nannaky Di], Finlay Main MacIntosh, Lena Currie [Nee MacKenzie [Di]], Ann MacIntosh [nee MacKenzie [Di]], Catherine Ross [ nee MacIntosh]. Front. Sue Main MacIntosh. 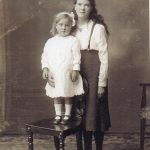 The photo showing Maggie Wilson and daughter Mary is not quite correct as Maggie Wilson was her maiden name and her married name was Vass.